Start the Summer Fresh with the La Grange, IL Farmers Market! Summer officially begins this week! It’s an excellent time to head out to the outdoor farmers market in La Grange, IL. Besides delicious food and fun in the sun, there are so many reasons to get out this time of year. So grab your sunscreen, grab your kids, and grab a wagon. Let’s check it out together! On Thursdays from 7:00 a.m. to 1;00 p.m., May through October, you can head over to the La Grange Village Hall at 53 S. La Grange Road for fresh, local produce and artisan food. There is plenty of free, covered parking on the corner. Who’s at the La Grange Farmers Market? If you haven’t heard, local means fresh and good for the economy in your community. Would you rather wait a week for a rock-hard, greenish peach from the West Coast to ripen on your kitchen counter, hoping it doesn’t rot or turn pithy first, or would you rather sink your teeth into a soft, juicy, yellow peach from a farm just down the road? When you buy your produce at the farmers market, you can be sure to get it at the peak of its freshness. And there are over 30 farmers and vendors from the surrounding area and the Midwest every week! And don’t forget eggs, honey, and maple syrup from the colorful Farmer Chuck with Swingbelly Farms. Merriam-Webster defines an artisan as “a worker who practices a trade or handicraft” and “a person or company that produces something (such as cheese or wine) in limited quantities often using traditional methods.” And you will find both varieties at the La Grange, IL farmers market this year. 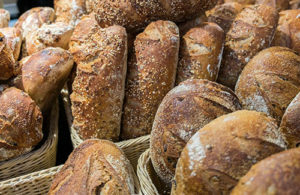 From meat, fresh bread, bagels, and other baked goods, chocolates, cheese, salsa, and other delectable specialties to lovely wares to cook with and decorate with, this farmers market has plenty to tempt you. If you’re lucky, you may even happen upon an 8-foot sourdough loaf at the Katic Bread stand. You can even pick up some yum-yums for your pets by visiting the Lovin’ Tails stand. Just looking at all this great food is sure to make you hungry, so be sure to take this opportunity to treat yourself to fresh, on-the-go meals from the local restaurants that come out for the farmers market. Be on the lookout for paella, pizza, wraps, soup, tamales, as well as bowls of veggies, grains, and meat. The best part is, these restaurants, like the market’s sponsor, Prasino, get their ingredients from the same farmers you are visiting with at the market! While you will be able to connect with plenty of local businesses and organizations that support the work of the farmers market each time you visit, the market also features a business or community organization each week in the activity tent. Most of the activity tents are geared toward kids, but grownups will love the learning, too. As a family, you can try out some yoga or bake a loaf of bread. You can even enroll in a CSA or learn about composting (and get rewarded for it!) with a group like Urban Canopy. Great food, fresh produce, and services you can use–what better reason to spend a Thursday morning (or lunch hour) at the La Grange Farmers Market? Firstly, let’s brag on ourselves for a minute: Illinois holds third place in the nation for farmers markets! Pretty impressive for a state with such a short growing season. Secondly, farmers markets are great for both farmers and non-farmers as they link our rural, suburban, and urban communities both economically and socially. Many farmers market attendees say the best part is talking to the farmers about the food they produce. But most of all, when you support the La Grange Farmers Market, you get not only the best tasting, but also the most nutritious food you can buy for yourself and your family. Local means fresh food doesn’t sit in a warehouse in a partially preserved state awaiting a long trip across the country (or in some cases, the world!). It is picked at it most perfect moment and brought directly to you. And there is no guessing about what is in season. The Illinois Department of Agriculture has a great breakdown of when different varieties of produce are in season. But don’t just take their word for it–just look around at the farmers market! Early in the season, you will find plenty of berries, greens and lettuce, onions, and peas. 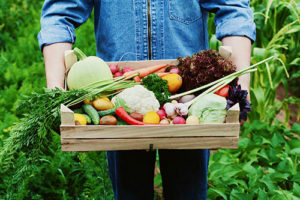 In June and July, you will also find apples, bell peppers, carrots, eggplant, garlic, melons, nectarines, okra, peaches, plums, potatoes, tomatoes and other root veggies. And in August–peak season–you can find just about any of your favorite fruits and veggies. You’ll want one of everything! Want to live close to this and other great markets in the La Grange, IL area? Nancy Miller, Realtor with Coldwell Banker, can help you find that home you’ve been dreaming about. A long-time resident of La Grange, IL herself, Nancy brings over 25 years of experience helping people buy and sell their homes. Let’s grab a coffee and get to know each other!